Making Stuffed Mushrooms, and Yeast Battered Sole Fish. Today was our last class for Use Food Preparation Equipment. 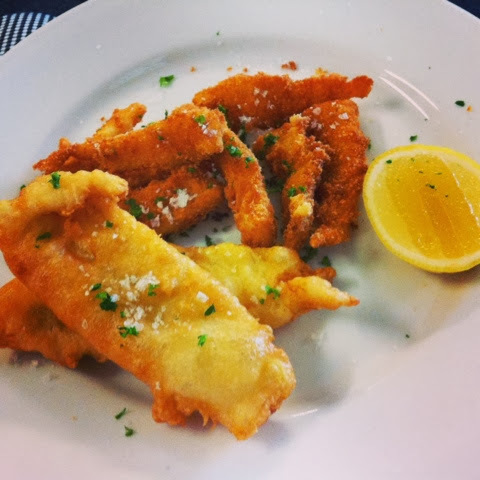 Crumbed Sole, and Yeast Battered Sole. For our final class, we had to make crumbed sole fillet, yeast battered sole, fried chicken and stuff mushrooms. The first order of the day was the stuffed mushrooms. The first thing the teacher told us was to not wash the mushrooms, but rather to peel it as mushroom is made up of water. Anyways, the mushrooms that we used were the white field mushrooms. The mushrooms and onions were finely diced (duxell) Onions were stirred over melting butter using low heat. Then the diced mushrooms were added over high heat, with a pinch of salt, and pepper and chopped parsley. I also learnt to make garlic butter... which well, is just melted butter over low heat with diced garlic simmering. So the base of the mushrooms were brushed with the garlic butter spread, then filled with the diced mix, and breadcrumbs were spread on top. It was then baked on silicon paper lined tray for about 10 mins. One of the things we learn in a cooking course is that we cannot sit, or stand around class doing nothing. Every minute which we have free needs to be occupied with a job or task that can be completed. First we had to activate the yeast, which we use a still active yeast source and place it in warm water. The yeast is then "fed" with a pinch of sugar and left to "bubble" and rest near a warm source. In the mean time, we learn to use a filleting knife to cut open a sole, which is also a flat fish. The sole fish is different from the normal fish, as it has both eyes on one side of the fish, and the other is used to swim. The skin of the fish is "peeled" off (because it was frozen and defrosted, which makes things a lot easier than if it were fresh). Learning to fillet a sole fish was an experience. Meanwhile, the yeast is now ready to be used. It is mixed with the plain flour, water, oil, salt and one whole egg (in that order) and left to rest again. Next we move on to the sole which has been filleted. It has two large sized fillets and two small sized fillets. The small sized fillets are cut into quarters and then floured in plain flour, egg wash and then breadcrumbs. It is then placed into a deep fryer of about 180 degrees celcius to cook until golden brown before removing and left to dry on tray lined with kitchen paper. Moving on to the yeast batter, we then flour the big sized fillet, and then dip it into the yeast batter. It is then slowly held by its tail (make sure it doesnt slip and drop into the fryer with a plop, which is what happened!!) and then taken out when golden brown. It is then plated on the porcelain plate, and garnished with chopped parsley, sea salt, and a wedge of lemon. The teacher told us that if we had to cut through the bones using our chopping knife, it would be the wrong technique. She demonstrated to us how to "pop out" the bone to separate the the thigh section from the maryland cut, and hold a knife straight to cut it at the "popped out" bone section..
Then she showed us how she "popped out" the bone section between the drumstick and thigh section, and used the knife to cut between the sinews. See ma, no bone cutting!! After that we just marinated the chicken in lemon juice, tarragon leaves, a pinch of black pepper, paprika, 20 grams of corn flour, 30 grams of plain flour, and some leftover chopped parsley. The thing about deep frying chicken is that it has to be completely cooked due to fears of salmonella. I fried mine for about 15 minutes, and it was well cooked after that.